The design presents the original state of the frontage (right) and its redecoration by Antonio Beduzzi, an imperial theatre engineer and designer. Beduzzi based his design on the existing state, supplementing the frontage area with layered planimetric ornamentation. A pivotal role was played by sculpted decoration and military emblems associated with the military career of the count. Detailed decorative drawings are part of an important phase in the history of the Valtice/Feldsberg, Liechtenstein Chateau. The chateau, residence of one of the most prominent court families in the Habsburg monarchy, Valtice, was constructed on the border of Lower Austria and Moravia in the first half of the 17th century, with finishing touches added towards the end of the century. Its construction was associated with a number of leading architects active in Vienna (Giovanni Battista Carlone, Giovanni Giacomo Tencalla, Giovanni Tencalla, Giovanni Pietro Tencalla, Domenico Martinelli, Pietro Giulietti and others). 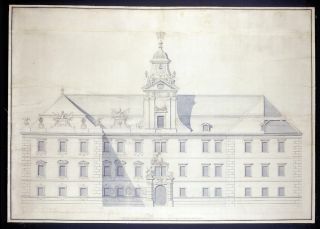 Yet the final phase of the construction, during which the building acquired its present appearance, only came about during the period of the counts Anton Florián and Josef Jan.
Anton Josef Ospel, the architect of the first part of the final phase between 1713 and1722, produced a bold design merging the newly modified older sections with new outbuildings and administration tracts. In the following building phase, a new count put a halt to the further spread of the construction and concentrated on decoration of the interior and frontages of the main corps de logis, for which he hired Antonio Beduzzi. Beduzzi created a series of high quality drawings for the count that served as template modellos for the final building modifications. The residence of a prominent Habsburg court family saw a major reconstruction in the 18th century under a new architect, the imperial theatre engineer and designer Antonio Beduzzi. He created a series of drawings that served as templates for the final building modifications. 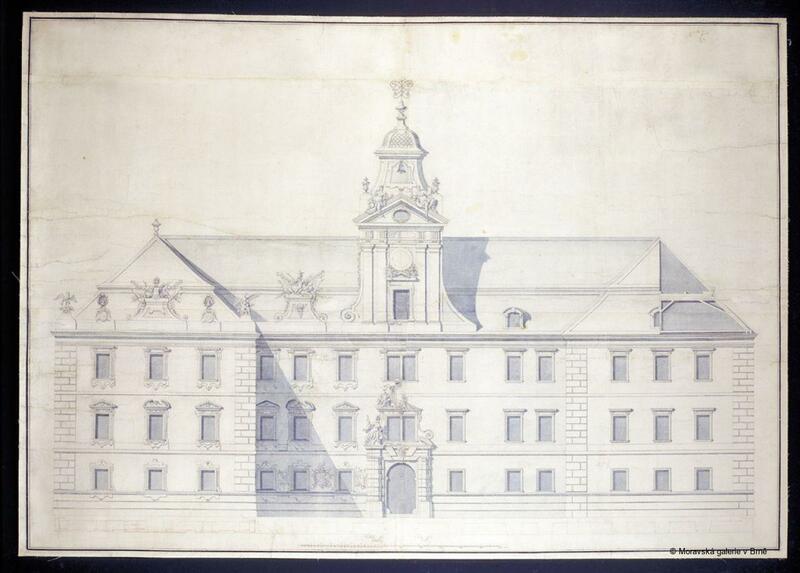 The drawing comes from a large collection of designs owned by the Brno architect František Antonín Grimm. Until 1945 it was located in the Rájec nad Svitavou Chateau, from whence it was transferred to the Museum of Applied Arts, Brno. In 1961, when the Moravian Gallery was established, the drawing became part of the gallery’s collection of historical drawings and graphic art. Wolfgang Georg Rizzi, Antonio Beduzzi und Johann Lucas von Hildebrandt, Alte und Moderne Kunst XXIV, 1979, Heft 166–167, p. 36–45. Jiří Kroupa, František Antonín Grimm –­ architekt 18. století, Brno–Kroměříž, 1982, cat. 14, 1. Zdeněk Kudělka, in Ivo Krsek –­­ Zdeněk Kudělka (ed) –­­ Miloš Stehlík –­­ Josef Válka, Umění baroka na Moravě a ve Slezsku, Prague, 1996, pp. 229–231. Jiří Kroupa, in Jiří Kroupa (ed), Dans le miroir des ombres. La Moravie a la age baroque 1760–1790, Brno–Paris–Rennes, 2002, p. 134, cat. 27. Professor Jiří Kroupa studied Art History, History and Sociology Masaryk University, Brno. He was a curator at the Kroměříž Museum and the Moravian Gallery in Brno before joining the staff at Masaryk University in 1988 (Head of the Department 1992–2002; Professor 1999 to present). His particular fields of interest are in the history of architecture, 18th-century cultural history and the methodology of art history. His long list of publications includes an edition on the architect Franz Anton Grimm and an essay “The alchemy of happiness: the Enlightenment in the Moravian context”. He was contributing editor for the volume Dans le miroir des ombres. Moravie a la age baroque. 1670–1790 (2002).